At Stencila, we&apos;re aiming to provide a framework for the next generation of executable documents. We envisage interactive spreadsheets, notebooks and articles that are highly structured (i.e. made up of a variety of fine grained document nodes) and strongly typed (i.e. only certain types of document nodes are allowed in certain places). To achieve this we are representing executable documents as a tree of JSON data and using JSON Schema to specify and validate how that tree can be structured. This post briefly introduces some of the development approaches we&apos;ve been finding useful in developing schemas for Stencila. Although these are not the types of nodes you&apos;d normally expect to see in a static document produced by, say, Word, they are necessary for a reproducible, executable document. In this post, I&apos;ll be using, as an example, the schema that we are in the process of defining for Environment nodes. An executable document will probably only have one Environment node – to define which packages, and versions of those packages, are necessary to execute the document. A JSON Schema is itself just a JSON document. The various properties of the JSON describe the schema providing both documentation and defining validation constraints. Below is the current draft of the Environment schema. This post is mostly about how we develop and use these schema so we won&apos;t go into more details here about it, but check out the json-schema.org site if you want to understand how to interpret this schema snippet. The $schema property gives the URL of the schema against which a JSON document should be validated. For a JSON-Schema document, its $schema is a "meta-schema" i.e. the schema for schemas. This script is run as part of the continuous integration job for the repository to continuously check that the schema definitions are correct. One of the advantages of defining a JSON Schema is the growing ecosystem of developer tools that can make use of them. 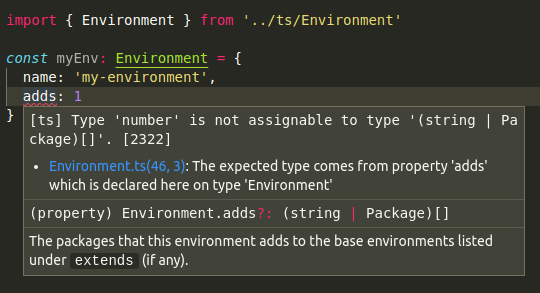 As we saw above, some editors like VS Code have built in support for JSON Schema to provide you with warnings if your JSON document does not validate against its $schema. JSON is quite a verbose format for creating structured data. An alternative is YAML. YAML is a superset of JSON, meaning that any JSON document is also valid YAML. Because of its better readability, YAML is an increasingly popular format for configuration files. We have been finding that writing example documents in this way has been useful for checking that the schemas we are defining are useful for both machines and humans! For this purpose, the schema repository has a script schema-to-typescript.js which translates JSON Schema into Typescript using the json-schema-to-typescript package. * The name of the environment. * Description of the environment. JSON Schemas are a powerful approach gaining increasing adoption. We are looking forward to using them to build tools for rich, composable and reproducible, executable documents. We&apos;ll be continuing to define and refine our schema definitions. Get involved by the joining the discussion at our Github repo, in our Gitter chat, or in our community forum.